"Supporters Gather Mail for POWs"
Dallas: While Joe McCain sits on a bamboo cage dressed in POW clothing, Pete Nasmyth, also dressed in POW clothing, stacks mail in a truck. 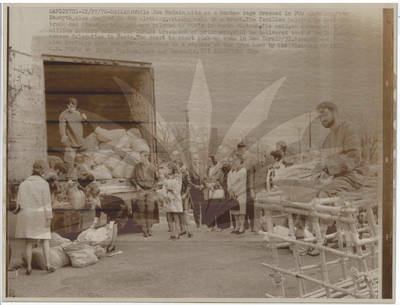 The families helping to load the truck and standing at right are related to POWs in North Vietnam. The mail, an estimated 13-million letters asking for humane treatment of prisoners, will be delivered to the North Vietnamese delegation in Paris. The coast to coast pick-up ends in New York 12/31. Nasmyth and McCain have brothers that are POWs. The cage is a replica of the type used by the Vietcong to hold US POWs in South Vietnam, Laos and Cambodia. BW Photograph, 11" x 8.5"